The score to The Meg is packed full of intricate and beautiful themes. The way I review albums, I always have four albums for review on my iPod at any one time. To start with I try to ignore the press information or which composer is involved. This allows me to come to every album, for the first play through, with no preconceptions of what I'm going to hear. One of the first things I noted with this score was how much like Call of Duty 4: Modern Warfare the music was. So, it came as no surprise to discover that Harry Gregson-Williams composed the music for both. A lot of the times it's not so much themes that are similar, rather than the sound and the was the instruments/digital elements are used. This is most notable in the tracks 'Even the Score' and 'Shark Cage'. This to me was an added bonus, as I've always loved the soundtrack to Call of Duty 4. 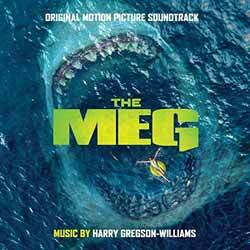 Speaking about the score, Gregson-Williams said: “For The Meg, I set out to create a memorable recognizable sonic motif which follows the mystery of the great Megalodon - something robust in nature, which acted as a kind of warning call and instilled an immediate sense of fear and suspense when signaled. In search of this sound, I stumbled upon the conch as an instrument of musical focus. Its call was both distinctive and ancient, and I felt it offered a voice to the vast terror of a concealed underwater world." The album contains 18 tracks (51 min, 05 sec) and it works incredibly well as a standalone album of intricate and multi-layered set pieces. I've been playing it on and off for a month now and I know I'll be returning to this again in the future. Another rich and varied album from Gregson-Williams.